Firstly, this dish looks very appetizing and will become a decoration of any festive table. Seondly, it is low in calories and very useful. 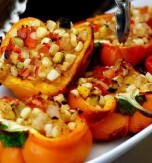 Roasted tender bell peppers stuffed with soft brynza (a brined cheese traditionally made from sheep's milk). Everything is rather simple and yummy. Minimum of effort and you’ll get a full-flavored hors d'oeuvres. 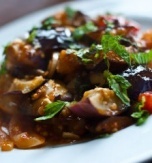 You may also serve these vegetable rolls as a main-course side dish, whatever you prefer more. 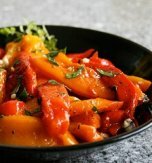 Wash bell peppers and grease them with vegetable oil. 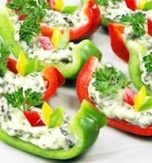 Cover a baking tray with foil and arrange the bell peppers above the foil. Bake them at 200°C (392°F) for half an hour. Then transfer the peppers to a plastic bag and leave them for 10 minutes. Peel the peppers and remove the stems and seeds. Cut the peppers into strips with 3 cm width. Cut brynza finely. Wash fresh dill and chop it finely. Peel a clove of garlic and squeeze it. Combine the brynza, dill, and garlic. Stir the ingredients carefully. Place the prepared filling above the each piece of pepper and roll them. 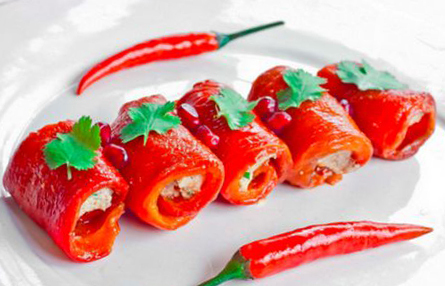 Transfer the rolls to a serving plate and decorate them with fresh parsley and chili peppers. 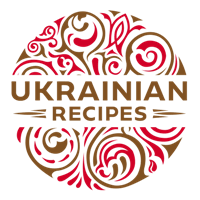 Do you have a favorite recipe of Ukrainian bell pepper rolls? If so, please let us know in the comments below or write us an e-mail.